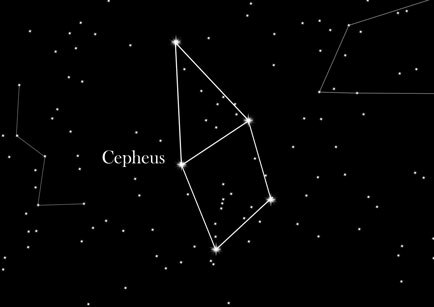 The constellation Cepheus is a less flashy constellation next to Cassiopeia and the Dragon. Cepheus is a constellation from the collection of Ptolemy and one of the oldest constellations. Because the Cepheus can be observed throughout the year this is one of the so-called "circumpolar constellations". Cepheus is located near the north celestial pole and has no star that is brighter than magnitude 2 - that makes it look distinctly unimpressive as its neighbors (Cassiopeia and Dragon) has much brighter stars than Cepheus. The southern part of Cepheus is an offshoot of our Milky Way. Very nice to watch, its many variable stars and double stars, for example, the famous Delta Cephei. According to the Greek mythology, Cassiopeia, the wife of King Cepheus, believed she was more beautiful that the daugters of the sea god Nereus. Therefore, the daugters demanded the punishment of Cassiopeia. Posseidon, another sea god, therefore sent a sea monster for her. She was however saved by Perseus in the end, and to this day, they still both have a place in the sky.